This is Stark Hutchins he is one year and 4 months old. He is a very loving and playful german shepherd. He loves the water and going fishing with me. He is also very caring. A few weeks ago my mother was home alone and she had fell and bumped her head on the corner of the table. She told me later when I got home that Stark had licked her wound and laid down by her side until she was able to get up. He has made me and my family very happy and should be the German Shepherd Dog of the month. I am so glad you sent in a story all about your handsome boy Stark. I love the name too, BTW! He is such a little hunk. And from what you've mentioned here he is very smart and empathetic too. A good dog to have around! So at this age you should expect to have a wonderful companion for several more years to come. Maybe sometime in the future you can send us some updates on how he's doing and some more pictures too. 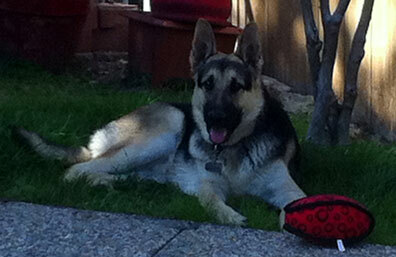 And thanks again for sharing your German Shepherd Dog Stark with us all! Continued success - German Shepherds Rule!! Stark is a very Handsome male! He truly is your Protector with that on guard attitude staying with your mother until she is better. Take care of your boy and he will always take care of you.